Land use planning generally involves an analysis of a landscape, including its hydrology, geology, and soils, and, based on that analysis, provides a blueprint for conservation and development. Smart land use planning directs utilization of the land to accommodate a variety of needs while maintaining a functioning ecosystem and healthy natural resources for the long term. Smart growth is a form of land use planning that is popular today. It is designed to contain sprawl development, preserve the land with the best soils for agriculture, and maintain an adequate amount and distribution of habitat and resource lands. 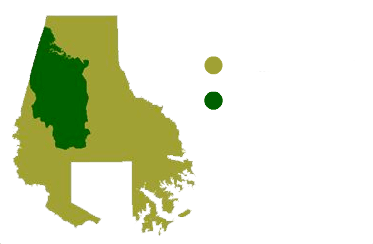 One of the most effective components of Baltimore County’s planned growth control is the Urban Rural Demarcation Line (URDL, pronounced irrdle). This line was created in 1967 and restricts the delivery of public water and sewer service to only 1/3 of the county’s land area. Baltimore County is perhaps unique in that it contains no incorporated towns or municipalities. The urban area is the land within the URDL and everything outside the line is rural. The VPC and its constituents work consistently to maintain the integrity of the URDL ““ literally holding the line ““ and steadfastly oppose attempts to alter the line or extend public water and sewer beyond the line. Baltimore County has been fairly vigilant about maintaining the line, although a number of “single house” connections outside the URDL have been approved. While hardship cases near the line are tempting to accommodate, the VPC believes that giving into requests for extensions is a chink in the armor that we cannot afford. Exceptions add up over time and can result in a death by a thousand cuts. Land use and development in Baltimore County is guided primarily by the Baltimore County Master Plan. This large, comprehensive plan is updated every 10 years and receives a good deal of community input. The VPC is very active in the updating process and makes extensive comments. The 2020 plan was adopted in November 2010. Browse additional planning resources and publications. Planning and preservation are tools and actions that allow the residents of a community to guide its future. If you do not plan or fail to act on plans, the future will unfold based on someone else’s ideas and actions or happenstance. Plans are challenging and sometimes tedious to produce. Citizens have conflicting ideas and expectations. The planning process helps to inform and stimulate thinking. Common ground is eventually found. When citizens have helped develop a plan, they are more engaged in its implementation and defense. Preservation is a result of planning. Take the Rural Legacy areas for example. Analysis showed where large blocks of land with good soils existed. Those areas were designated for preservation by conservation easement and a dedicated source of funds to purchase development rights was established. The desired result is occurring, and large chunks of fertile farmland are now permanently preserved, and more land in these areas is being protected every year. Without this forward thinking (i.e., planning), and subsequent action, farming would become unviable in many areas due to fragmentation of the rural area and incompatible land uses. Preservation also incorporates a personal kind of planning, that is, family and estate planning. Farmers typically have to decide how to hand the farm down to the next generation. Should they split up the farm, sell it off in entirety, develop a portion, or put the farm into preservation? There is a lot to consider. Baltimore County is fortunate to have a number of good local land trusts who can help a farmer evaluate these critical options and develop a plan that is good for the family, the farm, and the community. The VPC is always involved in a variety of short- and long-term planning projects. Staff and board members often serve on committees that are working on specific plans or issues. Recent collaborative planning efforts include preparation of the Baltimore County Master Plan 2020, the redevelopment plan for the state’s Rosewood facility, recommendations to revise the county’s RC2 (agricultural preservation) zoning regulations, and study and recommendations for improving stormwater management. VPC staff and members also participate in the Comprehensive Zoning Map Process (CZMP) that occurs every four years. During this process, any person or entity can request a change in zoning on any property. Planning and community associations often submit requests to change the zoning on a range of properties that have been targeted for a specific reason, often environmental concerns. VPC staff and board members also participate in larger efforts, such as forest management and sustainability. The county environmental agency hosts a workgroup on this topic. Issues being discussed include deer overpopulation, invasive species, stressors to oak tree population, fragmentation of privately-owned forest resources, constructive utilization of yard waste, stream buffers, easements, and many others. There are many planning initiatives underway at any given time ““ some led by the VPC and others where the VPC is a participant. Plans are only as good as the input offered in the planning process, so it is very important to have informed people on the team.